“Give Me Liberty Or Give Me Death”. These were Patrick Henry’s words on March 23, 1775 that inspired delegates including future presidents Thomas Jefferson and George Washington to activate troops for the Revolutionary War. This July 4th we celebrate independence and the liberty to be free. The fact you are reading this post is a testament to our freedoms. The freedom I want to highlight on this Independence Day is not found in our Constitution, but our founding fathers laid its foundation. The particular freedom I invite you to celebrate with Finxact is the freedom to compete. While our founding fathers sought independence, that very independence established our national need to compete. Human nature and in fact our entire culture is Darwinian. Science proves that through competition, living beings adapt and continuously improve. So does society and so does an industry and so does a bank. Our nation has thrived on the ability to compete as a union and our ability to compete relies on our ability to continuously improve. Without independence we would not enjoy reading this post on an smartphone over some wireless network, at the speed of light, while sipping our favorite July 4th beverages. At Finxact, freedom and independence is fundamental to our design and our existence. I recently spoke to an investor type who said “if your design is so open, and your system is so agnostic to everything it touches, and your core banking system is so ‘pluggable’, where is the stickiness? Isn’t that a bad business model”. My reply to him was that “Freedom and Independence from legacy systems, IS the stickiness”. Finxact believes that our value creation comes by freeing customers and partners to be independent, to compete, to improve, and drive margins by breaking out of the lowest common denominator status quo constraints of old technologies. Of course, there are billions of dollars of revenue built on a competing view of providing just enough transparency and innovation to lock in customers. But bucking the status quo and living free propelled our country from startup phase to the largest economy in the world. 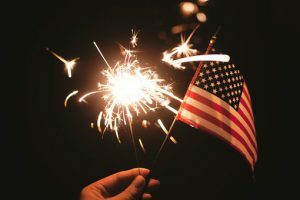 Celebrate Independence with Finxact this July 4th – and everyday!